A Tenshug is a special ritual offered to high lamas to create the necessary merits and conditions for them to extend their lives. When a Master is manifesting illness or uncertainty in living, students should arrange a tenshug offering done in all its completeness. When the Master lives long, the Buddha Dharma will grow and benefit beings. The Buddha Dharma’s growth is dependent on Masters. H.E Choeje Ayang Rinpoche is the Founder and Director of all Amitabha Foundation organizations around the world, the Drikung Charitable Society, Thupten Shedrub Jangchub Ling Monastery in Bylakuppe, Dechen Choeku Ling Monastery in Mundgod, Serlung Monastery in Kollegal, Amitabha Meditation Center in Kalimpong and Bodhgaya in India and the Amitabha Foundation Retreat Center in Nepal. Following the advice and instruction of HH the XVI th Gyalwang Karmapa Rangjung Rigpe Dorje, Ayang Rinpoche travelled abroad in the early seventies to teach and is one of the foremost Tibetan Buddhist masters who introduced Buddha Dharma to the West. 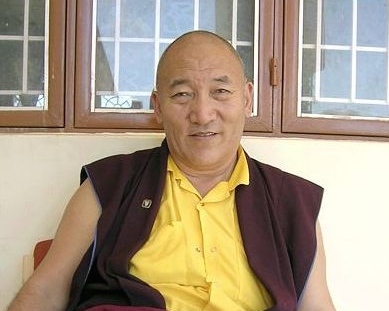 He is also the first Drikung Master instrumental in introducing the Drikung Lineage to the West. Many high lamas had recommended a Tenshug (long life offering) for H.E Choje Ayang Rinpoche last year in 2014, when it was the obstacle year for Rinpoche according to Tibetan calendar, the horse year in which Rinpoche was born. At that time we did extensive White Tara and Amitayus tsok offering prayers. Following the advice of the masters, Rinpoche has now accepted the Tenshug offering. H.E Choeje Togden Rinpoche, the spiritual Dharma Master and leader of Drikung Kagyu Lineage in Ladakh will be the Vajra Master of the ceremony and offer the Tenshug to Ayang Rinpoche. The Tenshug (long Life offering) will commence with an elaborate Tsedrup (long life puja/ritual prayer) dedicated to the long life of H.E Ayang Rinpoche that will last for 4 consecutive days from April 30 to May 3’2015. The extensive prayers, with chanting lasting from morning until night, will be conducted at the Thupten Shedrub Janchubling Monastery of Ayang Rinpoche in Bylakuppe, by Tulkus, Khenpos and monks, including others attending the ceremony from outside. It will culminate in a grand long life Tenshug offering to HE Ayang Rinpoche on the auspicious full moon day of 3 May 2015, the day of Buddha Amitabha, with meditation, recitation of Sutras and taking Eight Mahayana Precepts. It is considered an auspicious day in the Tibetan Calendar with positive deeds performed at this time being especially potent for Buddha Dharma in general and for the flourishing of the enlightened activities of Rinpoche. For those students who wish to attend the ceremony, kindly confirm by sending an email to amitabhafoundation@yahoo.co.in and a copy to drikungcharitablesociety@yahoo.com. Alternately, you may call the monastery at +91 8223 254220. For those who are not able to attend this special occasion, we suggest you dedicate your practice and prayers for Rinpoche’s long life. Kindly send any donations towards the Tenshug expenses to the bank details mentioned below, or for those desiring to make small donations by PayPal or credit card, or to receive a US tax-deduction for their donation, please send your check made out to Amitabha Foundation and mail it to Post Office Box 2572, Aptos, California 95001, or click below to donate online. Beneficiary Name: Drikung Charitable Society, P.O Bylakuppe-571104, Mysore District, Karnataka State, India.